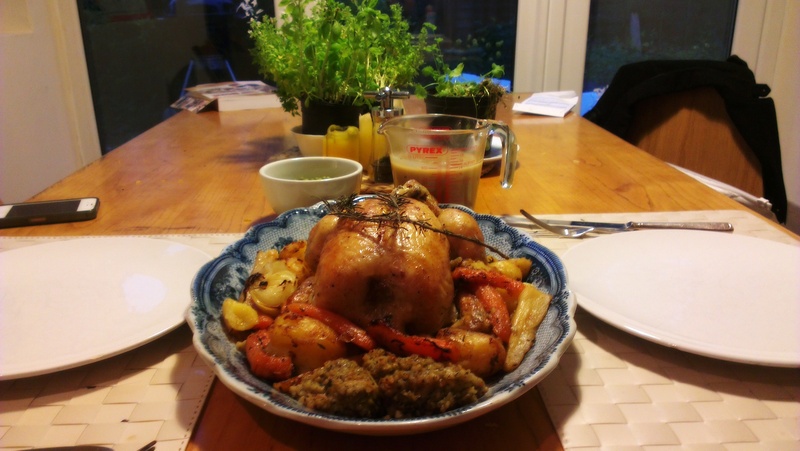 Whilst I originally conceived this recipe as merely detailing how I like to Roast a chicken, I realised that preparing a roast is much more than that. Besides the technique, it’s all about balanced timings, and the ingredients working together. At least, when I prepare a roast the Chicken is dependent on the vegetables and vice versa for an all around winner of a meal. So strap in – this Guesscipe will work in chronological order of what needs to be done. Look at the cooking instructions of your chicken – set your oven to the right heat and make a note of exactly how long the bird will take. 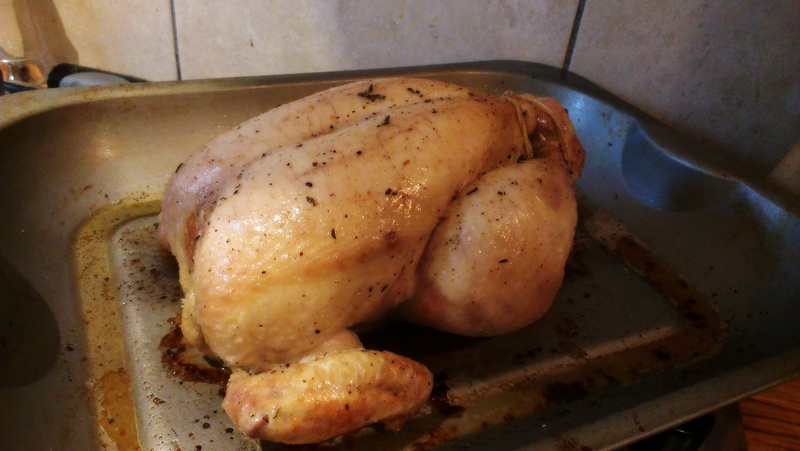 Put the chicken onto a large roasting tin, leaving significant space around the outside for your vegetables later. Cut the lemon in half and squeeze one half into the cavity of your chicken. 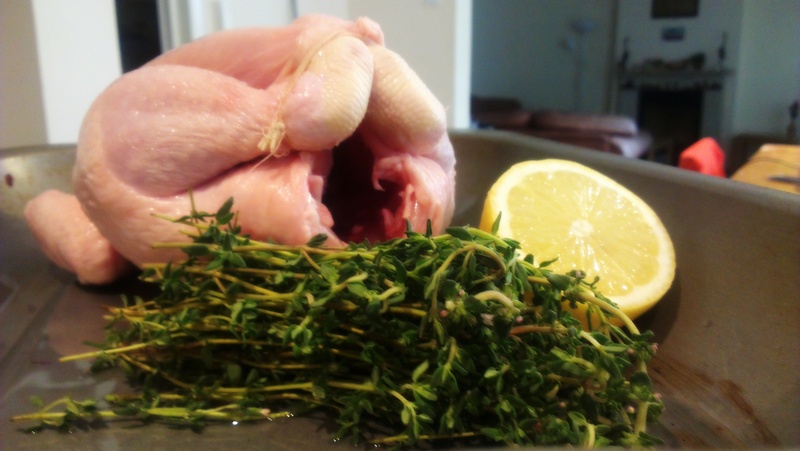 Then put the peel and the other entire half inside the bird, along with a large bunch of fresh thyme. Season the top of the chicken with salt and pepper, rubbing into the skin well with your hands. 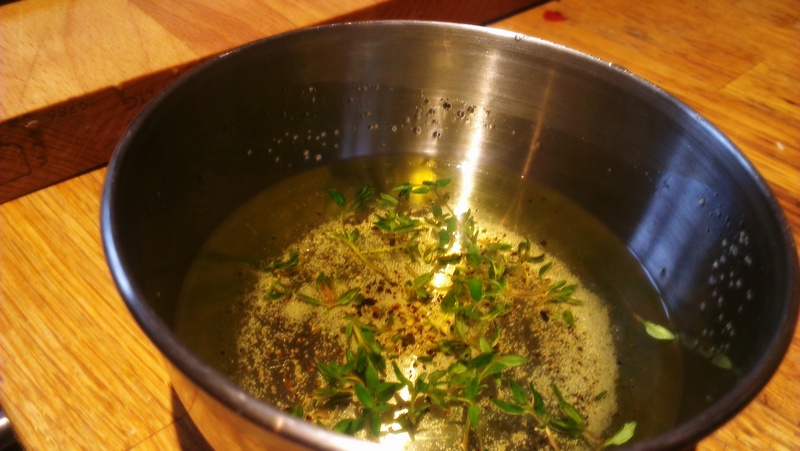 Melt some butter in a small dish and add more thyme to it. 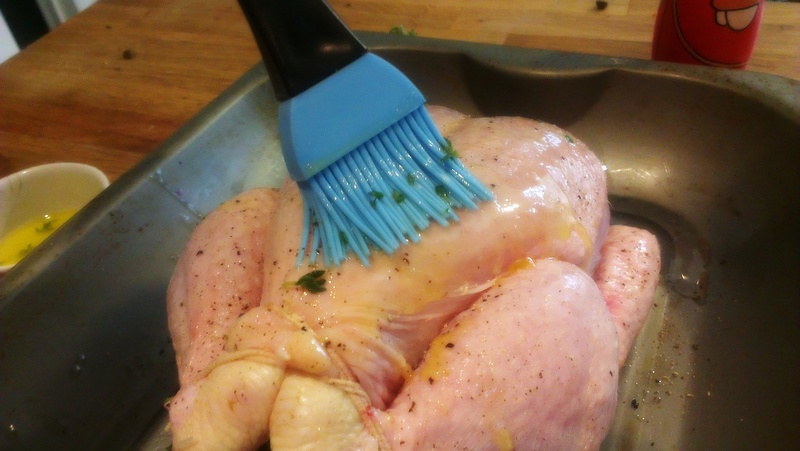 Use a brush to coat the chicken well. Put in the oven, covered, and begin the roasting. Generally I take my chicken out every half an hour to re-season and baste with the juices that have collected in the tin. Begin preparing your roasting vegetables. I personally like to peal my potatoes but leave the skin on the parsnips and carrots, but this is really a matter of personal preference. Exactly when you begin boiling these depends on the cooking time of the chicken. You want them to be ready when the bird has 30 minutes left. As such, I recommend putting the potatoes on to boil in salted water when the bird has one hour left. 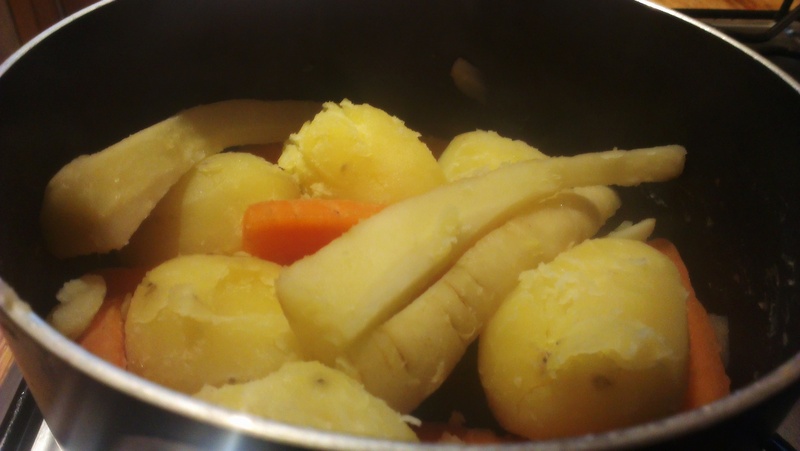 While the potatoes boil, fill a small dish with oil, herbs, salt and pepper. When the bird has 40 minutes left, add the carrots and parsnips to the boil AND pour the seasoned oil into the roasting tin with the covered chicken. When the bird has 30 minutes left, drain the vegetables. Shake them around a bit to make them fluffy but be careful not to mash them. 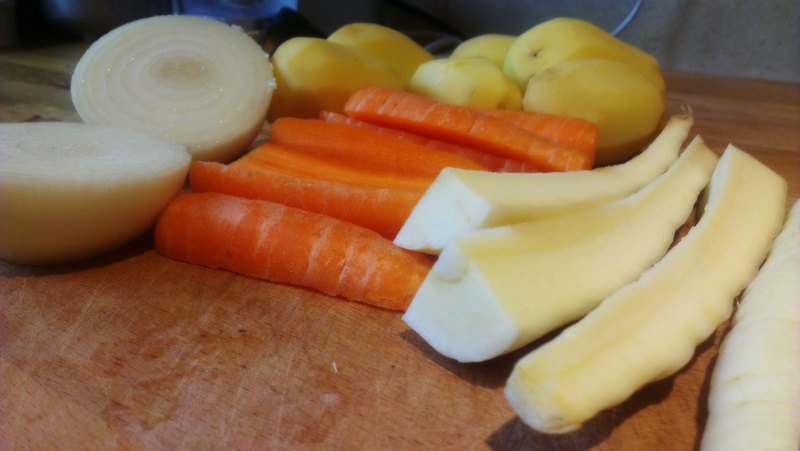 Uncover the chicken and add the potatoes, parsnips and carrots. They should sizzle in the oil. Move them around delicately with tongs so that they get thoroughly coated with the oil and each have their own space. I also place a quartered onion in the dish to add to the collective flavour. 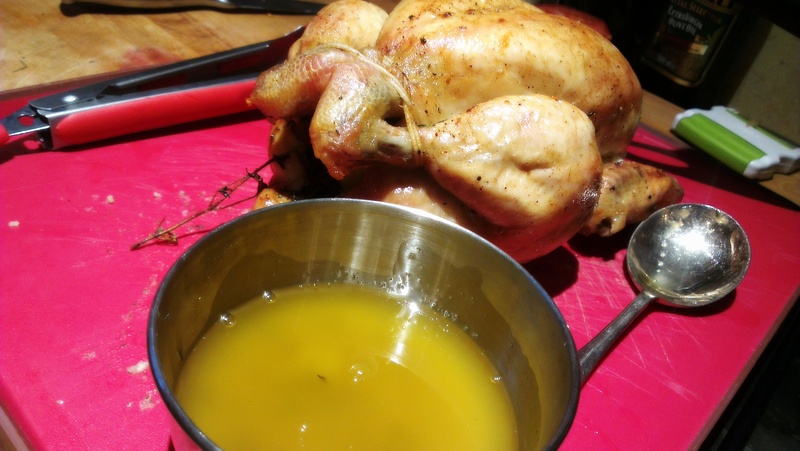 When the chicken is cooked (juices running clear), remove from the roasting tin and allow to cook on a chopping board. 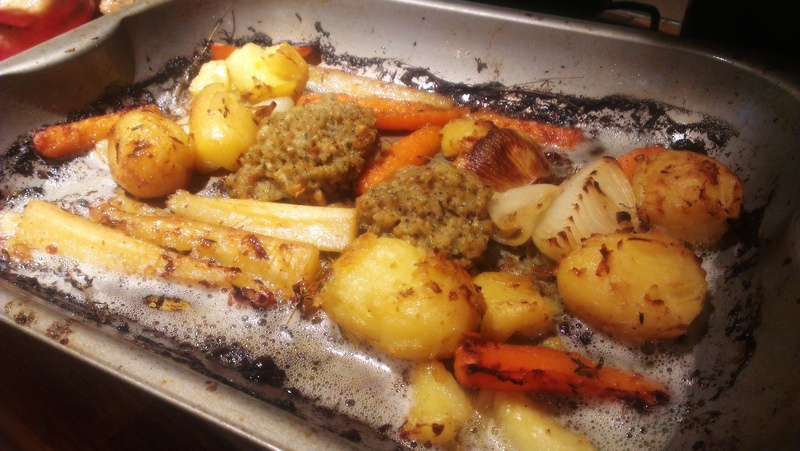 Be careful not to let the juices go to waste – save anything and put it in the gravy. keep an eye on these. From here it’s down to you. When they look crisp to your liking remove them. This should be the last thing you do before serving. Generally I find they take another 20 minutes or so. Also, this is the point at which I usually add Sage and Onion Stuffing to the Roasting tin and put peas on to boil gently. Whilst the chicken cools and the vegetables roast, pour the drippings into a saucepan. These contain the collected flavour of the vegetables, chicken, thyme, seasoning and lemon and are delicious. 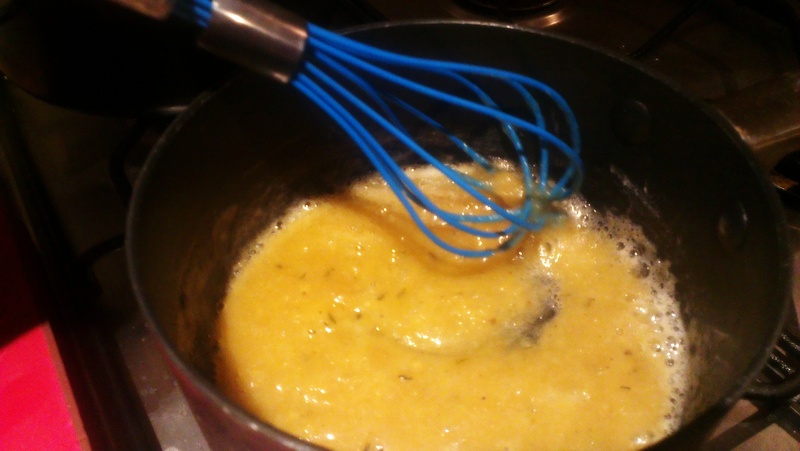 Heat on medium and when beginning to sizzle, add flour to make a roux. Cook this for a minute or two to remove the starchiness. 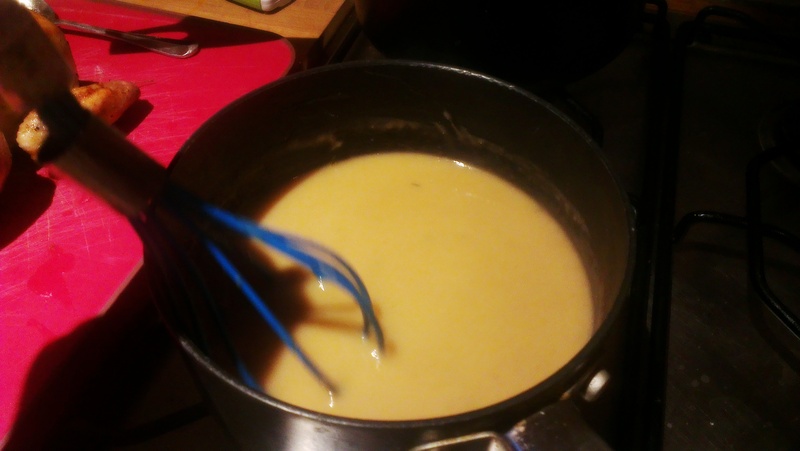 Add the cold stock and cook on medium, stirring frequently, until it thickens. I always add a splash of balsamic vinegar to give it a little bite. Wine will also work well for this. This gravy is particularly light because it’s a chicken gravy. Simmer on low, stirring, until the vegetables are done. At this point you should be ready to serve! You may wish to carve the chicken in the interim between gravy preparation and the vegetables being ready. For presentation reasons, I like to serve the chicken to the table, surrounded by the vegetables. People then help themselves to vegetables and one person carves – this is nice at special events but isn’t always feasible. What this man lacks in charisma, he makes up for in skill, so if you’re a little unsure of how to carve a chicken, take a look at this. Hope you enjoyed this recipe! Do you do things any differently in a roast? Leave a comment below. 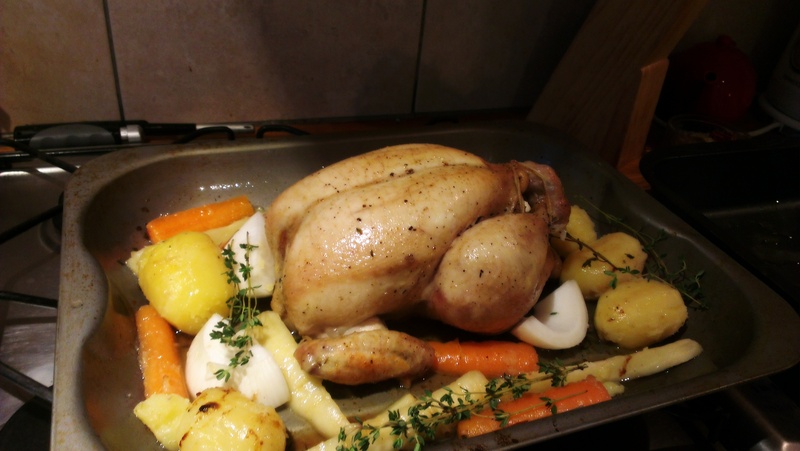 Posted in Guesscipes, Mains, PoultryTagged chicken, gravy, guesscipe, lemon, recipe, roast chicken, roast vegetables, sunday, thymeBookmark the permalink.